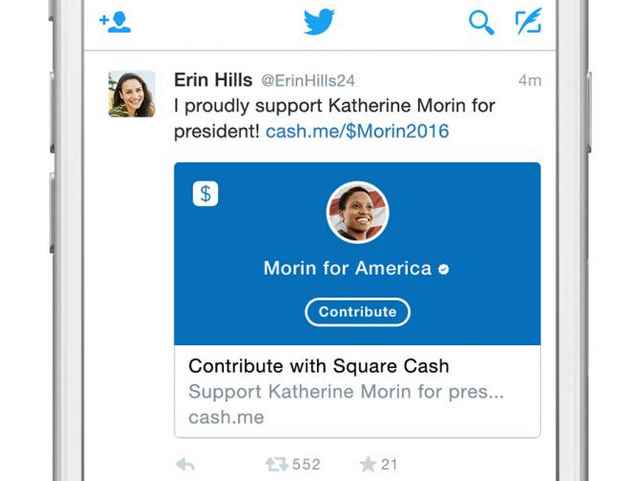 Political candidates have to go through a verification process with Square, then they can tweet out a $Cashtag to enable donations. Twitter has some interesting e-commerce functions. Thanks to Domino’s, you can order pizza through Twitter. Now, you can donate (powered by Square) to a political candidate through the site. When people have conversations about politics, they have them on Twitter. It’s what voters learn and share in these conversations that routinely motivates political action. That’s why we’re making it easier for Twitter users to actively support candidates and causes. We’ve teamed up with Square to enable anyone in the US to make a donation directly to a US candidate through a Tweet, starting today. This is the fastest, easiest way to make an online donation, and the most effective way for campaigns to execute tailored digital fundraising, in real time, on the platform where Americans are already talking about the 2016 election and the issues they are passionate about. Political candidates have to go through a verification process with Square, then they can tweet out a $Cashtag to enable donations. Donors, after clicking/tapping the “Contribute” button, will enter in debit card and vital information. Readers: What do you think of this idea?